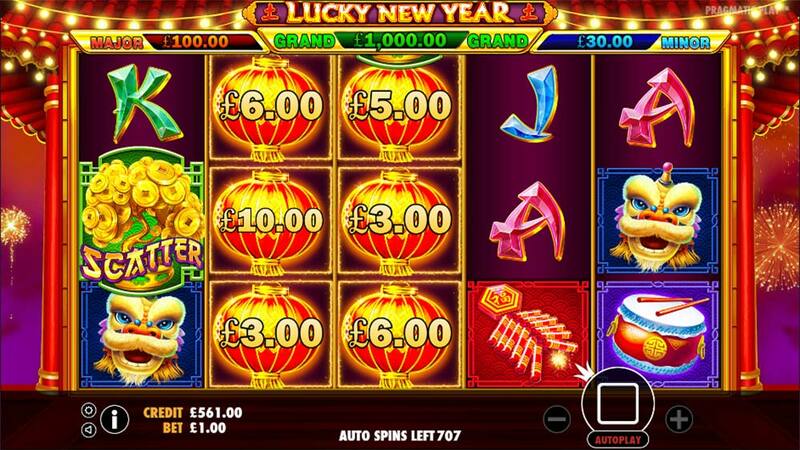 Celebrate the Chinese New Year on the Latest Pragmatic Play Slot – Lucky New Year! 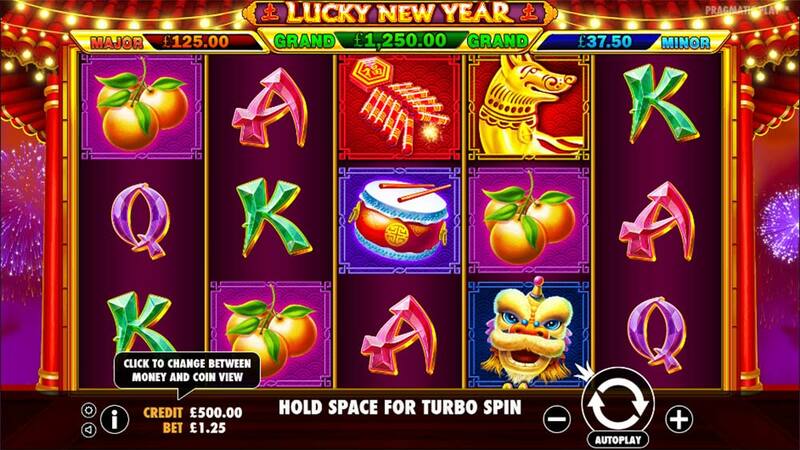 VideoSlots Casino has just added the latest Pragmatic Play slot to their casino today titled Lucky New Year in preparation for the Chinese New Year (Year of the Dog) which starts Friday the 18th of February. 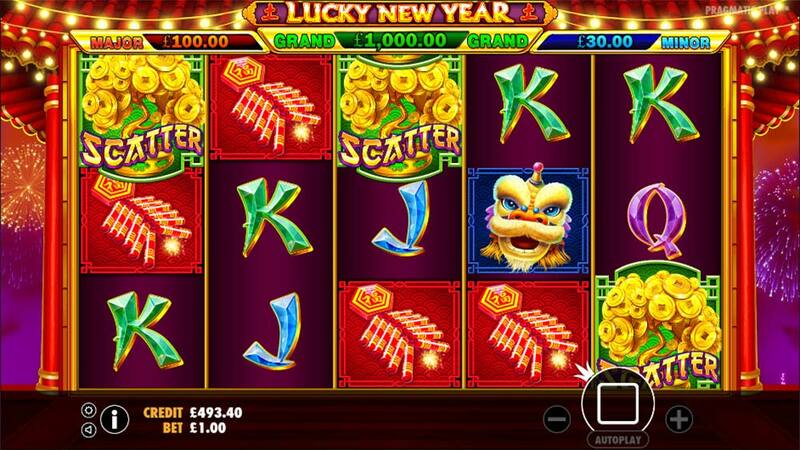 As you would expect from such a release this slot has a mix of fireworks, dragons and classic Chinese themed symbols on the reels and comes with 2 exciting main bonus rounds that include 3 different Jackpots up to 1000x stake and a “Gigantic Symbol” Free Spins mode. Using a regular 5×3 reel layout this 25 payline slot has plenty to offer in the base game with stacked wilds and 2 different bonus games to trigger, with plenty of “tease” sound effects when wins and bonuses are forming on the reels. The main Lantern Bonus round has a variety of cash prizes on offer and plays out in a similar, but not an identical fashion to the Divine Fortune slot progressive bonus round, with extra re-spins and additional cash prizes on offer along with the 3 different Lantern jackpots. The main free spins round uses a novel Giant Symbol which merges the middle 3 reels into 1 gigantic symbol reel which also includes the Wild and Scatter symbols. Whilst the Lucky New Year slot comes with a 3/5 volatility rating there is the possibility of wins of up to 1000x stake thanks to the Jackpots on offer in the Lantern Bonus round, so even whilst this may be a medium variance slot there is still some outlying big win potential. The Lantern Bonus feature is triggered in the base game when 6 or more of the lanterns with cash values land in view on the reels, you are then awarded 3 re-spins of the reels during the Money Re-Spin Feature where any additional Lanterns that land on the reels are held in place and that amount is added to the total win along with resetting the number of re-spins back to 3. 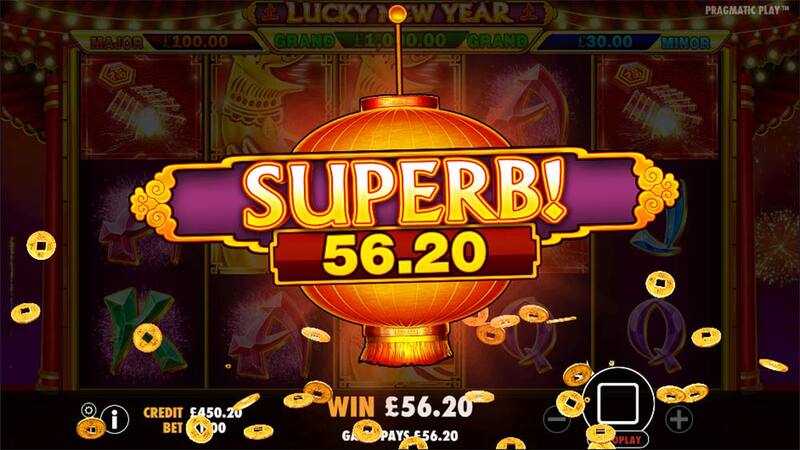 There are 3 special jackpot lanterns that can land on the reels either from the base game hit or during the re-spins, these are based on triggering stake size with the maximum jackpot awarding a 1000x stake win. This bonus round ends when no more lanterns land in view during the 3 re-spins. 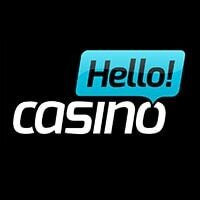 The Free Spins round is triggered by landing 3 scatters symbols on the reels on reels 1, 3 and 5 and awards an initial 5 free spins. During the free spins, the middle 3 reels of the slot are combined to create a gigantic reel and gigantic symbols on them which include the Wild and Scatter symbols, so you are basically looking for matching symbols or wilds on reels 1 and 5 to create wins. 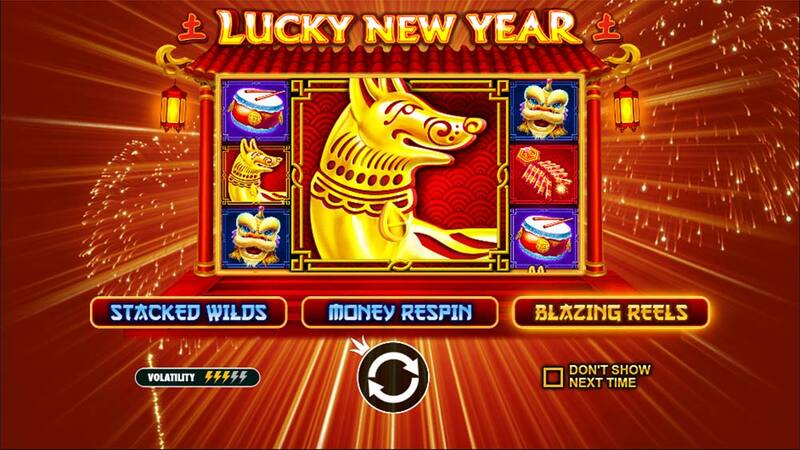 The Lucky New Year slot is a really solid medium variance slot release from Pragmatic Play that really captures the Chinese theme and Year of the Dog celebrations well, with plenty of excitement to be had in both of the bonus rounds and some decent hit potential in the base game too thanks to stacked wilds with plenty of “tease” sound effects and animations used. In our playtests, we managed to hit several base game wins well over 50x stake, with the Lantern and Free Spins rounds ending in the range of 5x up to 65x stake with plenty more potential on offer, although it has to be said that the free spins round can be quite disappointing if no matching symbols are found in the 5 spins that are initially awarded. 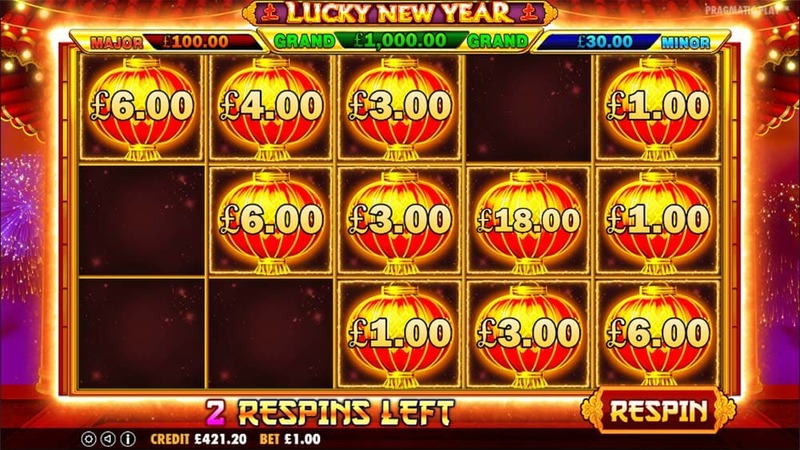 For us, the lantern bonus offers much more excitement and win potential thanks to the exciting re-spin mechanic and of course the 3 different jackpots on offer. Even if you aren’t a fan of this theme then check out Chilli Heat from Pragmatic which offers very similar gameplay with a Mexican/Chilli theme.